Out This Month is a roundup of new games that are coming out this month. [Note: First-season plot details ahead.] Things weren’t looking too good for the humans at the end of Telltale’s first season of The Walking Dead. Vengeful cancer patients stole your group’s getaway boat, people were getting devoured by zombies left and right, and young Clem still hadn’t found her parents. (What kind of monster could look that darling girl in the face and tell her that Christmas is off because her parents are now shuffling corpses?) But thanks to the sacrifices of a brave few, Clem escaped that hellhole of a city and set out to make it on her own. Last we saw her, she had spotted some non-shuffling, presumably breathing figures silhouetted in the distance. Will she go to them and find a new family? Will she hide behind a shrubbery? Will she kill them and use their entrails as a hat? 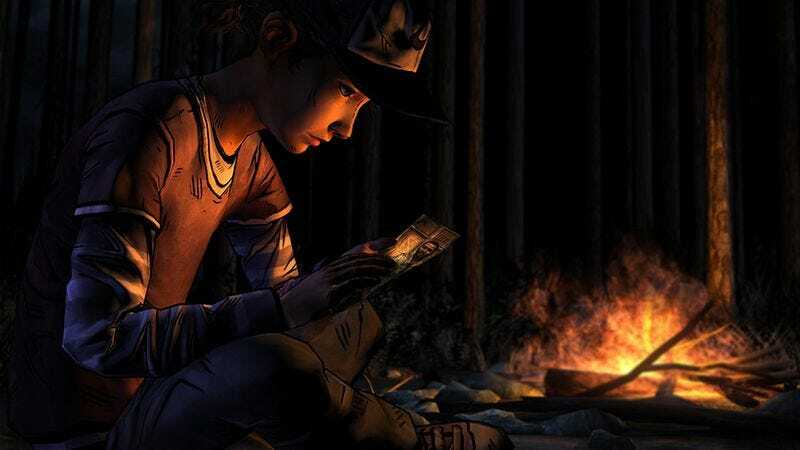 Your decisions from the first season—and the one-shot episode “400 Days”—factor into the new game, so Clementine is sure to be haunted by your poor choices for years to come. We’ve been told for months that the Xbox One will revolutionize games, change the way we sit on our asses, and dominate the living room. Whether or not you buy into Microsoft’s next-gen proselytizing, though, it’s at least safe to say that most of the new games look pretty, or as pretty as hellish battlefield carnage can get. After all, without the Xbone’s space-age specs, there’s no way we could play a game like Peggle 2, a colorful mix of pachinko, unicorns, and Snood. It may seem like something we could have played back in the day on our TurboGrafx 16, but rest assured, it’s super next-gen.
Talk about exclusive. Gran Turismo 6, Sony’s latest driving simulator, isn’t just a PlayStation exclusive. Its creators have even foregone putting it on the shiny new PlayStation 4. I like their style. While doing his usual brand of caustic ringside color commentary during WrestleMania V’s intercontinental title match between “Ravishing” Rick Rude and the Ultimate Warrior, Jesse “The Body” Ventura noted that the Warrior was in possession of a million-dollar body but a 10-cent mind. The critters in Tiny Brains don’t even have that. What they do have, though, is the power of teamwork, and by combining their 5-cent brains into, I guess, a single 20-cent consciousness made up of equal parts hamster, rabbit, bat, and mouse synapses, these diminutive creatures attempt to escape from a labyrinthine science lab before their tiny brains are harvested to power Amazon’s drone delivery bots. Just in time for the holidays, Saints Row IV is getting a Christmas-themed downloadable add-on. As the president of the United States living in a Matrix-style alien simulation, it falls to you and your gang of misfit miscreants to rescue Santa. (With Lee Majors in his mid-70s, there’s really no other viable choice.) If this doesn’t get the Saints off the naughty list, nothing will.